What “remarkably accurate” indicator is this? When can you expect it to flash? And how devastating the losses? Today we square our shoulders… set our jaw against the wind… and light out for the uncertain horizon. Since 1955, claims the San Francisco branch of the Federal Reserve, this indicator has accurately forecast all nine U.S. recessions. Only once did it cry wolf — in the mid-1960s. It has also soothsaid every major stock market calamity for the past 40 years. This indicator last went off in early 2006. It had previously flashed in 2000. On both occasions, mischief and havoc were soon at hand. This signal of recession is beginning to flicker and spark. What is this ominous indicator of which we write? The yield curve is simply the difference between short-term and long-term interest rates. Long-term rates are normally higher than short-term rates. The further out in the future… the greater the uncertainty. Investors, for example, demand greater compensation to hold a 10-year Treasury than a 2-year Treasury. And the 10-year Treasury yield rises when markets anticipate higher growth… higher inflation… higher animal spirits. The 10-year yield should therefore run substantially higher than the 2-year yield. But when the 2-year yield and the 10-year yield begin to converge… the yield curve flattens. And a flattening yield curve is a possible omen of lean times. The Federal Reserve controls directly neither the 10-year yield nor the 2-year yield. But being shorter term, the Fed exerts greater influence over the 2-year yield. And its current rate hike cycle has worked upward pressure on this key rate. Yield curve inversions generally occur when the Federal Reserve has been boosting interest rates. 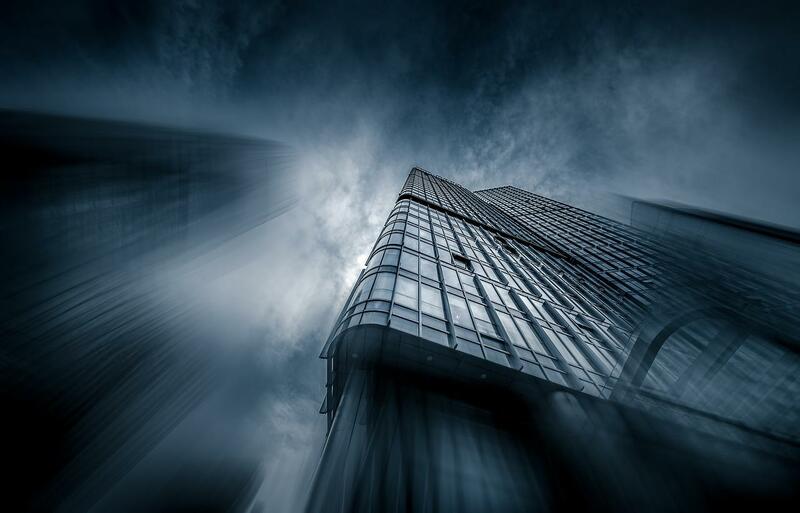 Because the interest rates that the Federal Reserve raises are short term, this tends to push the short term up relative to the long term, which is exactly what has been happening. Last September the 2-year yield was 1.25%. And today… it sits at 2.58%. Meantime, since topping 3% in late February, the 10-year yield has fallen… to 2.85%. The yield curve, therefore, is flattening (2.85% – 2.58% = 0.27%). And the Fed is doing the flattening. We note — in passing of course — that the yield curve has not been this “flat” since 2007. As the calendar confirms… 2007 preceded 2008. The flattening yield curve thus indicates recession may be gathering in the distance. While there are many explanations for why the curve is flattening rapidly, the consensus seems to be that inflation and the long-term economic growth outlook for the future are benign despite a recent spurt in economic activity. Evidently the market believes the tax cuts will run their course soon enough… and lose their oomph. And that inflation will stay in its cage. But is a flattening yield curve an immediate menace, a thundercloud overhead? Not necessarily, say the experts. Not yet. The yield curve can stay good and flat for a while — with no ill effects. The [yield] curve was extremely flat during the second half of the 1990s, a stretch of high growth. 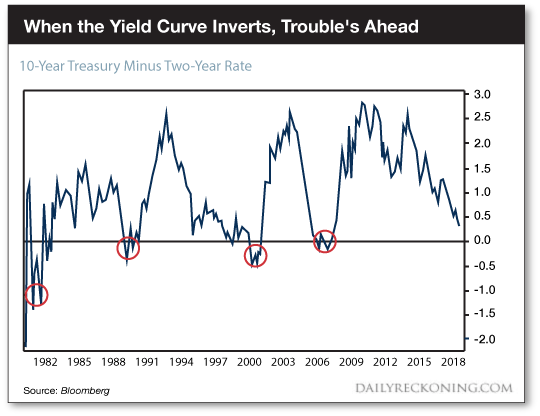 Only late in that period did the yield curve invert, finally foreshadowing the 2000 recession. Here this fellow points out the true bugaboo — the inverted yield curve — when short-term rates actually overtake long-term rates. It is only when the yield curve inverts that trouble follows. Right now the yield curve is flattening — but at 0.27%, it has not inverted. But when can you expect the lethal inversion? The Fed currently projects two additional 0.25% rate hikes this year — in September and December. The first rate hike should further flatten the curve as it pressures the 2-year Treasury. The second — in December — may just invert the slope. So all it potentially takes is the Fed following its publicly stated game plan of increasing rates by another 0.50% before the end of 2018, with that continuing to have a larger impact on short-term than long-term rates, and that could be enough to produce an inverted yield curve by the end of 2018. Does that mean you can expect recession later this year? History reveals the catastrophic effects of an inverted yield curve do not manifest for an average 18 months after the inversion. Let us assume the pattern holds. Let us further assume the yield curve inverts this December. We conclude the economy may hum and the stock market may purr for the 18 months following. Then comes trouble… sometime in mid-2020. Given the extreme duration of the current recovery and the super-inflated stock market, the thumping could assume historic grandeur. And the stock market could be severed in half. But the comeuppance nonetheless remains two years distant — if the foregoing holds together. Is Offshoring Behind U.S. Employment’s Current Problems?